Hindcast Approach | Research | Oceanweather Inc. The hindcast approach entails running atmospheric and ocean response models for a historical period (typically several decades long) in order to develop the specification of climate and extremes for an application. The science of the hindcast approach was pioneered by the Oceanweather (OWI) team starting as early as the late 1960s and has progressed to be the de facto standard for the development of extreme and operability data for structure design. The modern hindcast approach typically starts with the products of the global and regional atmospheric reanalysis projects such as the Climate Forecast System Reanalysis (CFSR) produced by the National Centers for Environmental Prediction (NCEP) in the U.S. or ERA5 climatology developed by European Center for Medium-Range Weather Forecast (ECMWF). These reanalysis products provide the output of a numerical modeling system using a static data assimilation and numerical scheme. While reanalysis data has shown great improvement over the past few decades, systematic errors on a regional basis and in extreme storms exist within the datasets. 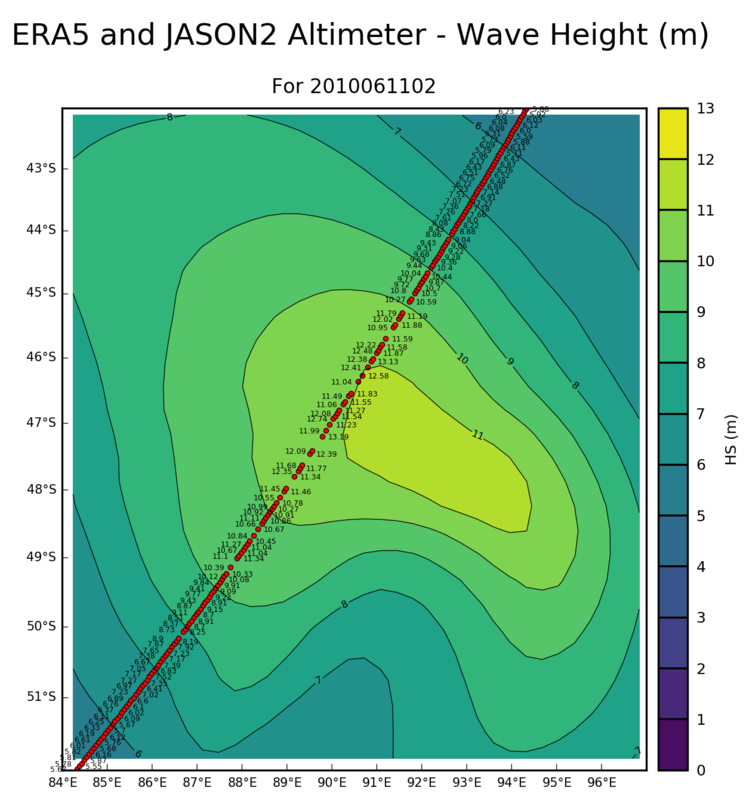 The figure to the right depicts the significant wave height in meters along the track of a satellite-based radar altimeter with the reanalysis data available from the ERA5 project. 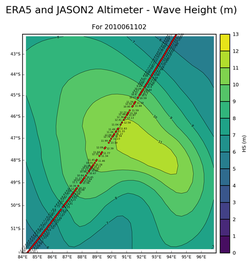 Despite assimilation of atmospheric data and inclusion of the altimeter waves themselves in the wave model component, the ERA5 is still unable to properly represent the true intensity of this extreme extra-tropical cyclone. This results not only in an underestimation of the peak wave height in the storm, but also an underestimation of the ocean swells escaping the storm. Such deficiencies are most commonly found in strong extra-tropical and tropical cyclones, but also can occur in monsoonal flow, coastal jets, and in areas of strong orographic influence on a regional basis. At Oceanweather, the hindcast approach is more than using reanalysis products and running ocean response models. The OWI hindcast methodology is centered on the detailed specification of the wind and pressure fields used to drive well-calibrated models. Oceanweather use a variety of data-driven methods to improve on wind/pressure forcing including dynamical and statistical downscaling, inclusion of analyzed tropical cyclones, and direct manual kinematic analysis of storm fields. It is attention to detail of the forcing applied in ocean models which sets OWI apart from others. Oceanweather's hindcast approach has led to a strong reputation in the industry and academia for high quality hindcast work. It is rare that there exists a sufficiently long-term history of accurate measurements of extreme storm generated winds, waves, currents and storm surge to estimate the probability distribution of extremes in the range of rare probabilities needed for calculation of design loads on offshore or coastal structures. At a few sites, instrumented platforms or moored buoys have acquired data over the past twenty years or so, and satellite altimeters have measured global wave heights over about a ten year period. However, while such data make it technically possible to compute extremes directly from the measurements, the reliability of such estimates must be questioned at least on the grounds that natural climate variability on decadal time scales is not properly represented. Therefore, even in areas with measured data it is still advisable to generate the long-term database needed to estimate the climate of extremes through a hindcast approach. Oceanweather's principals pioneered the development and application of this approach during their tenure at New York University in the 1960s and 1970s and extensively refined and applied this approach to the many new offshore development projects launched within the past four decades. Extrapolation of the hindcast and calculated extremes through the process of extremal analysis, which provides estimates of extremes associated with specified return periods (return period is the average interval in years between events equal to or greater than the associated extremes). Such data are then used by ocean engineers for the specification of design loads on structures. The hindcast of an individual historical storm consists of two basic steps. First, the time and space evolution of the surface marine wind field must be specified as accurately as possible. This process usually requires the reanalysis of historical meteorological data by experienced Meteorologists with the aid of calibrated objective analysis procedures and/or models. The wind fields are used to drive calibrated ocean response models (e.g. a spectral wave model, storm surge model, ocean current model) as the second part of the process. The prototype for modern hindcast studies was the Gulf of Mexico Ocean Data Gathering Program (ODGP), which began in 1969 and included an extensive measurement program, a wave hindcast model development and calibration phase, and a hindcast phase, all culminating in the establishment of reliable extreme wave heights and wave periods associated with hurricane-generated sea states in deeper parts of the Gulf of Mexico continental shelf between the Mississippi Delta and the Texas/Mexico border (Cardone et al., 1976; Ward et al., 1979; Haring and Heideman, 1978). Since ODGP, hundreds of dedicated hindcast studies have been carried out at Oceanweather for the offshore and coastal engineering communities to develop reliable extreme wind, wave, surge and current design estimates for specific offshore and coastal structures. Within the past four decades, many basin-wide hindcast studies have been supported jointly by industry operators. These so-called Joint Industry Projects (JIP), have also included the application of the hindcast approach as described above to the hindcast of several continuous years for the specification of the operational climate. Major JIPs administered and/or carried out by Oceanweather within the past four decades have addressed essentially every global basin. For more on Oceanweather's historical involvement in JIPs please see MetOcean Studies. Major continuous hindcasts by Oceanweather include a 60+ year hindcast of the North Atlantic (AES40, Swail and Cox, 2000) and the entire globe (GROW, Cox and Swail, 2000). 1976. Cardone, V. J., W. J. Pierson and E. G. Ward. Hindcasting the directional spectra of hurricane generated waves. J. Petrol. Technol. 28, 385-394. 1978. Haring, R. E. and J. C. Heideman. Gulf of Mexico rare wave return periods. OTC 3230, 10th Annual Offshore Technology Conference, Houston, TX, May 8-11, 1978. 2000 Cox, A.T. and V.R. Swail. A Global Wave Hindcast over the Period 1958-1997: Validation and Climate Assessment. J. of Geophys. Res. (Oceans) Vol. 106, No. C2, pp. 2313-2329. (Oceans).